Waterproof knee length wellington boot. Hiker boot; metal free, waterproof & c/w a breathable lining. Tan, fur-lined rigger c/w steel mid-sole. Waxy rigger boot with padded ankle c/w steel mid-sole. 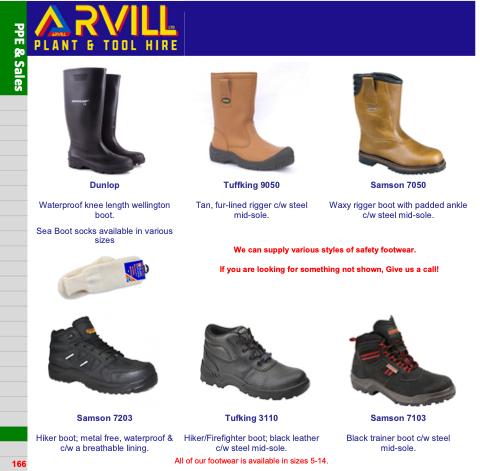 We can supply various styles of safety footwear. If you are looking for something not shown, Give us a call! Hiker/Firefighter boot; black leather c/w steel mid-sole. Black trainer boot c/w steel mid-sole. All of our footwear is available in sizes 5-14.